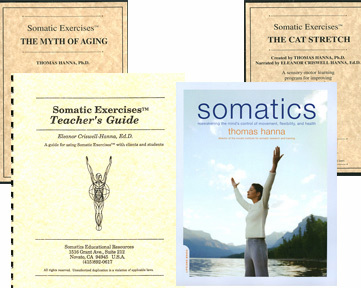 Somatics Catalog - Product Report: "#TCHR1"
SOMATIC EXERCISES[tm] Regular Teacher's Kit Teacher's Kits contain the essential start-up teaching materials at a discount for both Somatic Exercise[tm] and Somatic Yoga teachers and practitioners. "Deluxe" kits include a DVD, "Regular" kits do not. . SOMATICS book, (SER-10), The Myth of Aging- #700 CDs, Complete Cat Stretch-#150 CD, Somatic Exercises[tm], Teacher's Guide (TCHR-1). 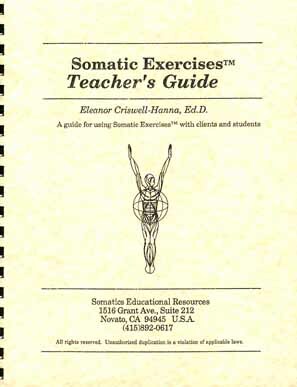 Somatic Exercises™ Teacher's Guide Discusses the basic definition of somatics, Somatic Exercises[tm] , how to derive the maximum benefit from them, and provides a class outline/schedule for teachers.